1. Lightly heat the brown rice with water and add the wakame , when the wakeme is soft turn off the stove add kelp and olive oil . 1.Cut collard greens in to thin strips , throw them in the pot with water .Cook for 2 minute then put the lid on the pot and let them sit for 1 minute so they will be soft but still crunchy. 2. Drain the remaining water , then add pressed garlic (optional ), olive oil and salt . 1.Cut the cooked sweet potatoes , put them into the sauce pan , add coconut oil , cinnamon and salt , stir fry for 2 minuets . 1. 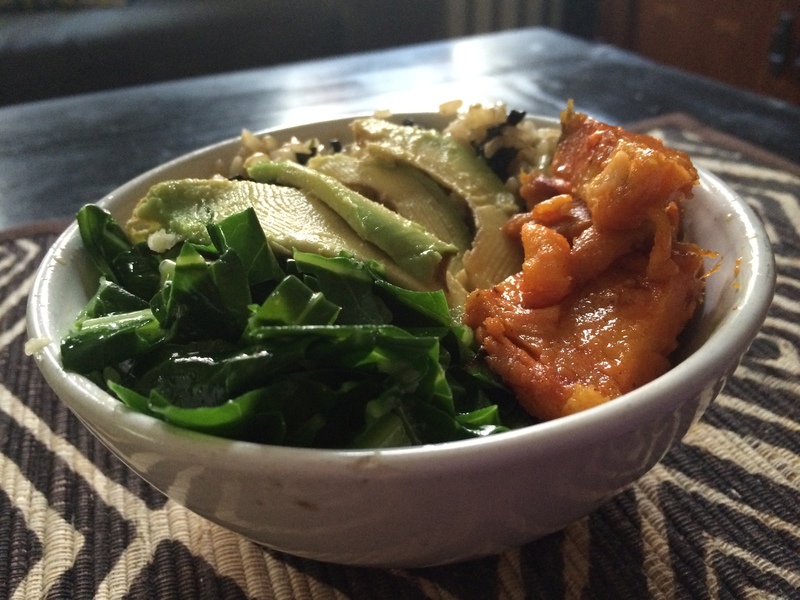 First add the brown rice in the bowl as a base , then collard greens on one side , sweet potatoes on the other and add thinly sliced avocado’s in the middle .and enjoy !